Welcome to Kushie Tushies! We are an online cloth diaper store and recently added a small cloth diaper store here at our home in Greensburg, PA. Our main focus is on natural & eco-friendly products with the intentions to create a more healthier and safer environment for our children. My name is Christie a stay-at-home mom of two. We started cloth diapering with our second child after finding out our son had severe sensitive skin to unknown chemicals in disposables. Now, knowing how easy it is, we would have done the same with our first. It has been very rewarding. Not only did our son's severe rashes dissipate when switching to cloth, we also save at least $100.00+ a month on disposable diapers. It is especially healthier for our baby and considering the fact that our garbage has been reduced by two bags a week it is excellent for our environment. We decided to try them out and we are glad we did. Now we've chose to inform others of the benefits of cloth diapering and to focus on Natural & Organic products for their children. Feel free to contact us if you have any questions. We have many products available. Feel free to check out our variety of cloth diapers which include: Bummis, Blueberry - Swaddlebees, Cotton Babies, BumGenius, Flip, Econobum, Hemp Babies, Best Bottom, Thirsties, GroVia, FuzziBunz, SoftBums, Rumparooz and more. We also offer hazelwood necklaces by Pur Noisetier (Pure Hazelwood), Healing Amber Necklaces for babies, children and adults, reusable sandwich bags from Planet Wise, all natural skin care products for baby and family from CJ's, all natural & organic toys and teething products from Green Sprouts and Under the Nile and Hevea, our natural laundry detergent from Rockin' Green and LuLu's, Ringley all natural teethers, all natural pacifier from Hevea and much more. Everything we sell we have personally tried and loved. We want you to be 100% satisfied with your products and our service. 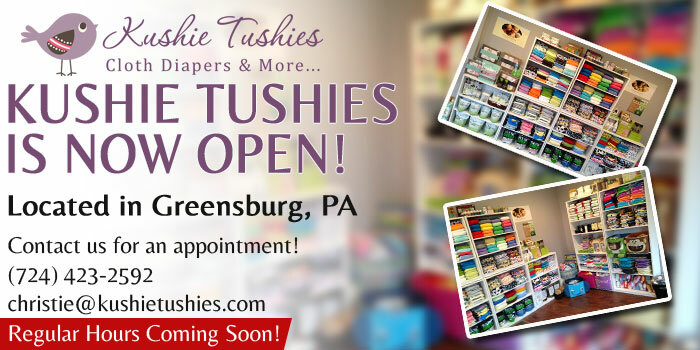 If you have any questions on cloth diapering or our natural & organic products feel free to contact us at Kushie Tushies at anytime.